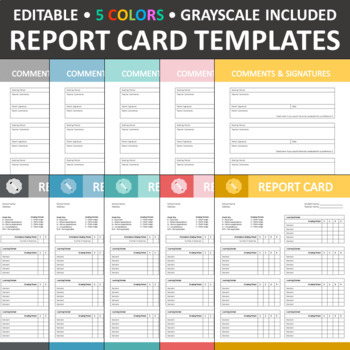 This download is for five editable report card templates in grayscale, light blue, blue-green, red-pink, and gold. 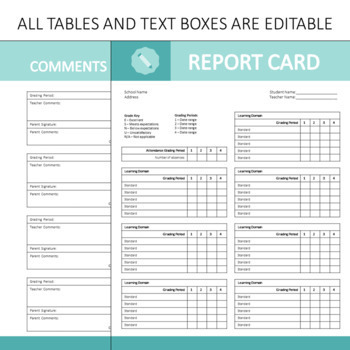 These report card templates are in editable formats so that you can modify it however you want. You do not have to use all the domains, the grading scale, or the number of grading periods in the templates—feel free to change them to fit your classroom and communication needs. The texts are in simple text boxes or tables, so edit the text, table rows, columns, and cells as you need! Please only download this if you are comfortable working in Microsoft PowerPoint. I did not include a separate section for Conduct because you can modify any of the tables that I created for learning domains for your Conduct grades. Please download the preview to see the samples up close. Thank you for looking!